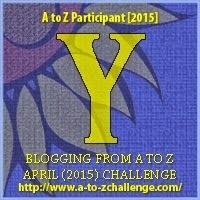 This is the Zany, Zealous and Zigzaggingest Zoom beyond belief A-to-Z April 2015 Challenge!!!! And I am an A to Z Participant. And it is Day 26, Letter Z the last, LAST DAY, of the alphabet, the last letter of the month, the last day of the month! Hey, tomorrow is May! Again this year I am writing a poem a day to celebrate National Poetry Month. It's my FOURTH YEAR in a ROW of writing a poem a day for the A to Z Challenge. My theme this year, is signs I've photographed and poems to go with them. Z last of z letters - Go visit others today! By no means oh, no, no-ly! The school picks up the load. From each home on the fly. They hop out at their homes. that you don't have to share. 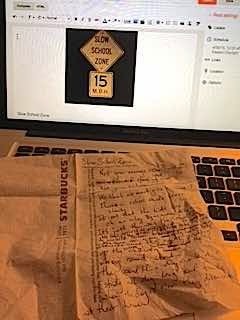 Here's my poem written on a Starbuck's napkin on Monday. Yes, I know. My husband gave me a notebook so I'd always have paper to write down poems. I forgot. And NOW, let's not forget to go visit Matt Forrest Esenwine who has the LAST LINE of the Progressive Poem, 2015! I can hardly wait to see how this epic poem ends! 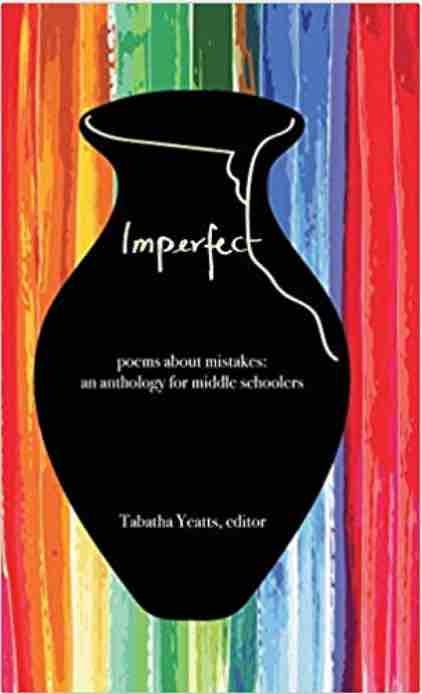 Thanks, Irene Latham, for organizing this fantastic National Poetry Month Progressive Poem. This was a blast! Yabba-Dabba-Do!!! And Yikes!!! 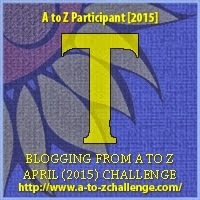 It's the next to the last letter in the A-to-Z April 2015 Challenge!!!! It is Day 25, Letter Y! Click Y to find more links to AtoZers! 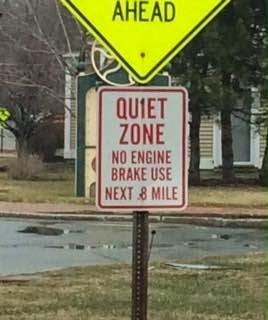 When I took this picture, it wasn't for the sign. 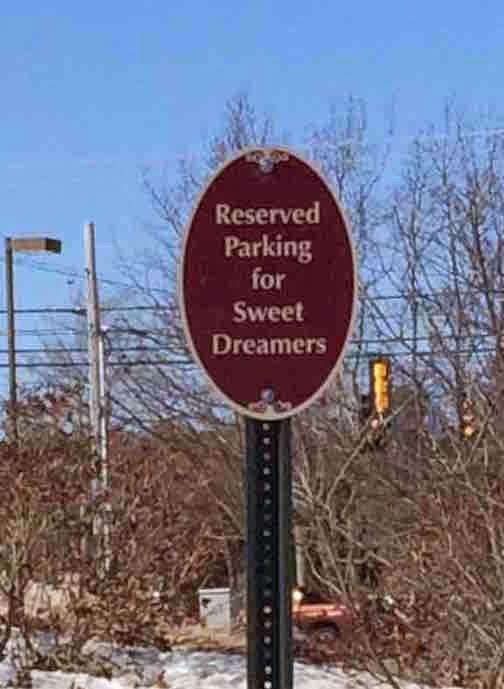 But I will do a poem for this sign, because I didn't find any other clever Y signs. So this poem will not be clever. I don't think it will be anyway. I haven't written it yet. I'll know in a little while. So again. I did not take this picture originally to be a sign photo. This picture was snapped because of the cars in it. See that car almost dead center in the picture? That car thinks it is parked. Or its owner does anyway. I think they needed to take a taxi to make it to the curb. It's a good thing you can only turn right from this direction, because that car is really in a driving lane. And you will notice that it isn't even winter. Parking is haphazard in the winter. All lines are ignored. Even if you can see them they don't count. So. A poem for YIELD. Haiku, acrostic, an ode? Nope. None of the above. It's a Dictionary Poem. As far as I can tell, I just invented this form. I wasn't sure if it would be a serious or humorous poem when I started this post. Now I'm still not sure. It seems to be an informative one in a humorous-ish way. I guess you will have to decide its poetic bent. PS: I've revised the poem to take out the word "yellow". When I wrote this I guess I wasn't looking at the picture and didn't realize it wasn't yellow and black. It's the strangest thing...I thought they were orange/yellow and black lettering, but they are not and have not been since 1971! How can it be that I have not noticed that they are all red and white signs now? I guess you see in your mind what you expect to see, and since I learned to drive seeing the yellow triangles, that is what I have been "seeing" in my mind's eye all these years. Wow. That is so strange. So anyway, I edited my poem to take out the yellow! Demanding that you toe the line! Did anyone do Yabba-dabba-do for Y today? And now for the Progressive Poem! Thirty poets, thirty days, thirty lines...today is number 29, so you know what that means, right? It's my turn AND it is the last line before the last line (Ha! That would be the next to the last line!) We seemed to have a lot of story left to tell when we were three quarters of the way through, but Irene Latham (inventor and instigator of the Progressive Poem) had faith that we would be able to come through with an ending. I think we've made it! I wonder if I took this the direction YOU would have! My part is in blue. “Born from the oyster, expect the pearl. “Watch for her. You’ll have but one chance to determine—to decide. "Papa, just a little longer in the pool! One more time down the slide! Please!" Was this a surprise to anyone besides me? I kept reading the slide part in the beginning and had started to picture a young girl in a pool. Then when I pictured myself at that age, I would have been pretending to be a mermaid, as I really liked swimming underwater best of all. SO take it away, Matt!!!! I hope I gave you enough to do the last act! 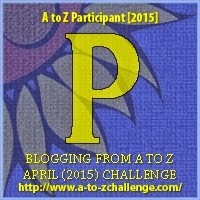 This is the eXtra, eXtravagant and eXcellent eXtravaganza beyond belief A-to-Z April 2015 Challenge!!!! And I am an A to Z Participant. And it is Day 24, Letter X! 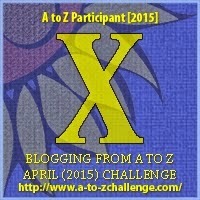 This X marks the spot where you can find more AtoZ posts! Do not use ah ahs heyah. And ta home ah cahs we pahk. If it's not next to U. If that was too hard to read, I've recorded it here! And today is the day Amy at The Poetry Farm adds her line to the Progressive Poem, and the day that I read it and fret over the next line...the line to be added. Go there and check out what she said! It's amazing. This poem is amazing! What am I going to do? Hmmm. 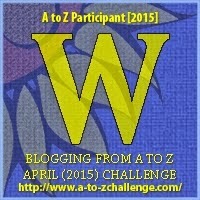 This is the Wired, Wonderous and Weird Wallapalooza beyond belief A-to-Z April 2015 Challenge!!!! And I am an A to Z Participant. And it is Day 23, Letter W! Please visit other AtoZers by clicking on the W! A truck on the highway in front of us... Really? That apostrophe is soooo enticing! It LOOKS so intelligent! "Use me! U'se m'e!" it crie's. 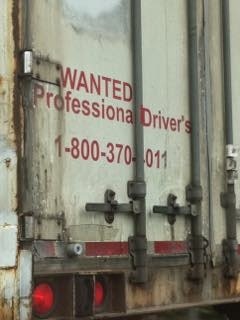 This company needs professional driver's AND sign painter's (I know! No apostrophes necessary. But they look so nice!) 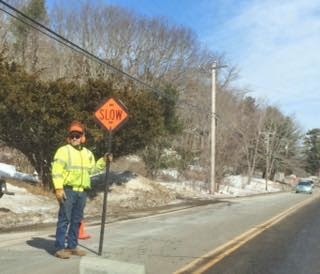 Let's hope that "they're" drivers are more attentive and careful than their sign painters. Or make your punctuation tight. Woo-hoo! We are on to X. I'm likin' X. It's going to be X-tra X-citing! 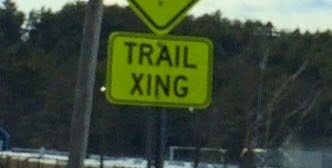 And you thought I couldn't find another sign with an x. This one won't be about kissing either. See you tomorrow! Oh, and don't forget to check out the Progressive Poem! 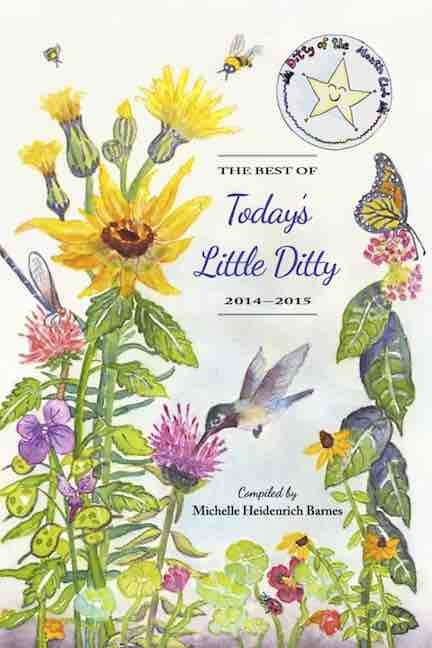 It's at Jan's BookSeed Studio today! See the line she's added to this collaborative poem for the month of April. It's getting to be quite the poem! But wouldn't you expect it to be with 30 poets adding a line apiece for the month of April? I thought I'd recap a poem I sent to Laura Shovan for NPM and her clothing theme. I did skirts. And at the end, I have further work on the Progressive Poem's mermaid. I'm just working on it, like a piece of writing. Yesterday was the first stage, today is the second stage. I'm still working on this...there are parts I don't like, so retrying. Like writing, I'm not sure we ever think it is "just right" and leave it alone. The image above irks me. There are parts that I really like. There are parts that don't fit the way I want them to. This happens in writing, too. 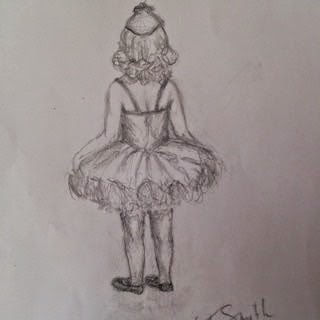 Because this is my picture and I am practicing, I have opted to erase legs and try again. The others were too long for as young a girl as I was envisioning. Then they looked like they started too low. Unfortunately with a pencil, I can't just select, cut and reposition... So the eraser gets used a lot. Here's the 45th try (okay, I don't know that it is the 45th, I just know I've messed with it LOTS...erasing and trying again). I still have pieces I am going to work in. Or I may set it aside and try another. And another. And another. Just like with writing. And someday one will come out MAYBE the way I was dreaming it would. http://etc.usf.edu/lit2go/ It is a free collection of stories and poems in audio and pdf formats. There are also many that have a word count, the reading level and activities for your classroom. And lastly, don't forget to check out the Progressive Poem. The next line is being added by Brian at Walk the Walk. 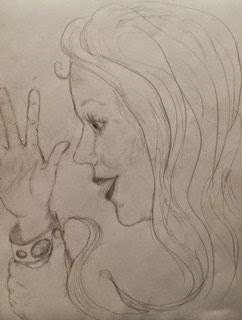 Part 2 - more shading and lines, minor perspective and size changes. I decided to put this image up again after further work on it...some additions and changes. This is mostly for myself. 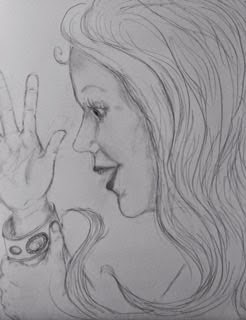 I have found that when I take a picture of a drawing or hold the drawing up to a mirror, I can see flaws in the perspective especially, that I can't see after a while of working on it. It is a lot like writing that way. Too close to the work, and you don't see obvious things. I'm too close to this one now, and I'm afraid I won't see what is wrong. I can see some things I want to fix, but right now I don't have just the right "word" for it, so I'm stopping again until tomorrow or the next day. Fresh eyes can see things better - just like in writing. 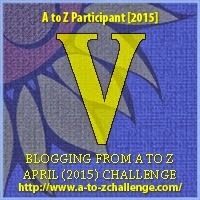 This is the Valiant and Very Vivacious beyond belief A-to-Z April 2015 Challenge!!!! And I am an A to Z Participant. And it is Day 22, Letter V! Click here to find more AtoZ links! 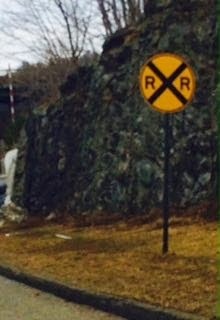 Road sign as I enter my real childhood town. slow days and slow sails. slowed down to a d r a w l.
my heart and soul craves. I was sitting in the parked car waiting for my husband to come out of the optometrist's office. I was editing a few pictures I had taken for the A to Z, and watching two men getting a building all set up to redo the front where a new business was going in. Two guys trying to fold/roll up a sign they'd taken off the building was a hoot to watch. But that's another story. There were many on that street as I sat there. I should sit there more often. So I was there waiting and working a little on my iPhone. Then I said to self, "You should write one of the poems now, and then you would have another scheduled to go!" To which I replied, "Yes, but I don't like to write on my phone. I make too many mistakes and it gets too frustrating for a poem writing." "Then find a piece of paper. You have a pen in your purse." So I began fumbling in the car door pocket beside me. I felt a crinkly paper and pulled it out. Ha! 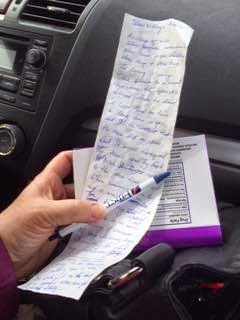 A grocery store receipt! And it's long. Now I need a flat hard surface. The only thing I could find was a box in that same door pocket - a box that still had two hand sanitizers in it. So I turned it over to the flat back and began writing the above poem on the receipt. Which came out in 5 minutes, with 7 quick edit spots. 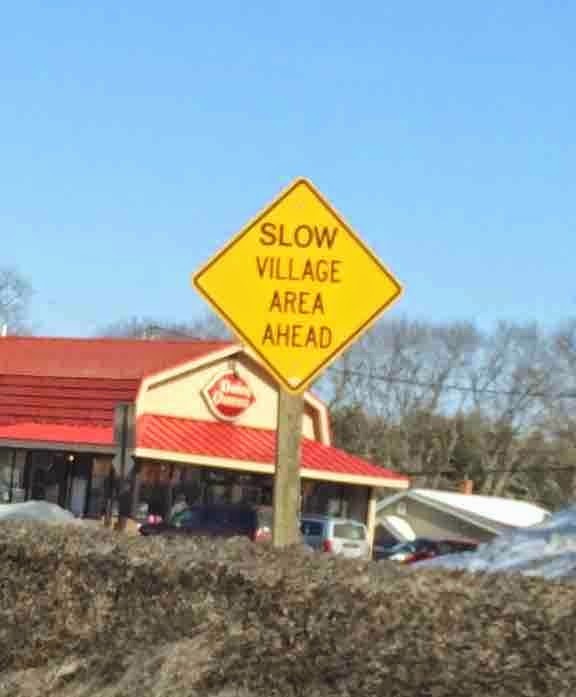 I had every intention of this being a cute, silly poem about calling the people in the village "slow"... but that is not what came out. I apologize to all who would have liked it to be more upbeat and tongue-in-cheek. I was fascinated at how quickly it took its place on the back of a receipt. I was going to write another poem, but by then my husband had come out, and besides, the next piece I pulled out was only 2 inches long...my first thought? A haiku would fit. I told my husband about finding the receipt to write on, and when we got home, he went in his office and came back with a little moleskin notebook that would fit in my purse. "Here, put this in your purse, then you will always have paper." Isn't that sweet? It's in my purse. I don't know if anything can replace a scridge (this should be SCRAP) of paper though! PS: I just checked to find out if scridge had a 'c' or a 'k' in it and found that it is scridge, but that scridge is actually the rough edge on paper that has been torn out of a notebook, not a small piece of paper. So this is totally misused by me, and has been for a while. I am not too old to learn this, so I am changing my ways. But I do so like that word. PSS! : I just figured out what I was really thinking of! SMIDGE! Or some would say a smidgen... Duh! Hey, scrap + smidge = scridge. Now don't forget to check out the Progressive Poem...we are nearing the end of the poem. Today is Tabatha Yeatts' turn, so head on over there in a few minutes and see what she has added to the mysterious mix. What will happen next to our Delta Girl turned mermaid with the turquoise bracelet from her grandmother? I'm getting antsy/nervous/excited/afraid about my line on Wednesday the 29th, so this afternoon, with my extra energy, I started drawing her, to get an idea in my head - something concrete. Here's my rendition of our girl in draft. I just wanted to try it out. It's not really finished - parts are missing and some other stuff I'd still change - not all quite to my liking, but I just feel like I'm warming up to drawing. It's relaxing to me and when something comes out the way I would like it to be, it is satisfying - like finding the right word in your writing. Is it time for W yet? This is the Ultimate, Unbelievable and Utterly Underestimated beyond belief A-to-Z April 2015 Challenge!!!! And I am an A to Z Participant. And it is Day 21, Letter U! And If you get a chance, stop by Laura Shovin's Author Amok and read her clothing poetry by guest hosts. I hosted this past Wednesday with totus and skirts poems. Go here to visit more unbelievable U posts! So consumers would halt car mobility. They decided to stay there and spend some bread. 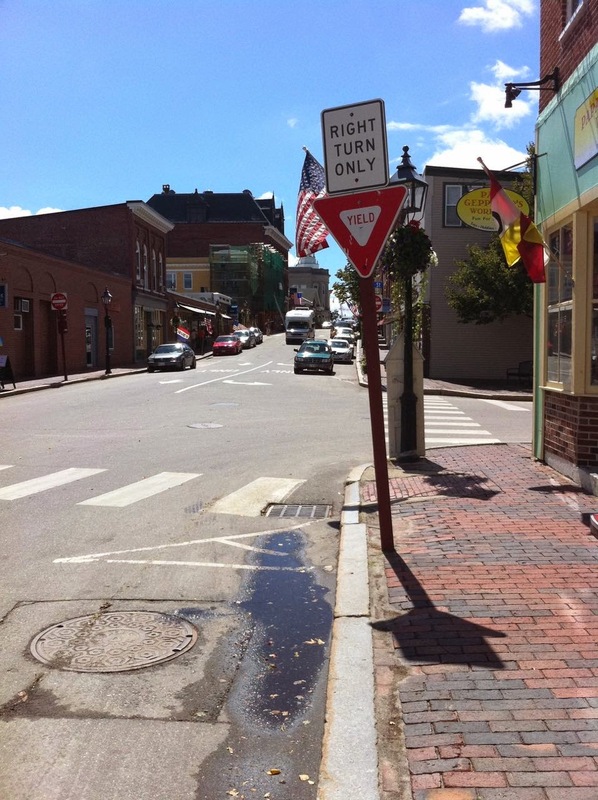 There is a town nearby that did something similar with pedestrian speed bumps, slowing drivers down through town so that they would have time to "see the sights", so to speak. I won't mention any names. V is Very close to being here....W...X...Y...and I found my Z picture, finally. April is almost over. And then I will ZZzzz. But before that happens today is also Poetry Friday! You can find links to more things poetic if you head to Renee LaTulippe's blog, No Water River . 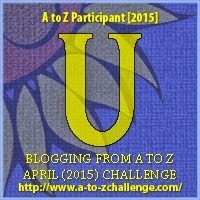 This is the Talent-laden, Triumphant and Totally Thought-provoking beyond belief A-to-Z April 2015 Challenge!!!! And I am an A to Z Participant. And it is Day 20, Letter T! I'm hoping you can also stop by Laura Shovan's spot at Author Amok and read my guest host post about skirts today, and check out the previous guest posts on more clothing related topics! It's a month of fun clothing poetry she's offering! 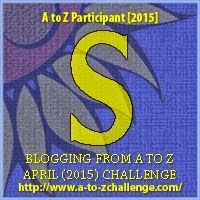 To visit more blogs in the AtoZ Challenge, click the T! Is this a lovers' lane? This seems a bit insane! And we can stay in bed. Unless I get very bUsy, it will be Useless to go visit U. YoU won't know Until tomorrow if I Used the Unclaimed U for a Unique poe-Um, or if I Ushered it out the door. This is the Super, Sumptuous, and Seriously Stupendous beyond belief A-to-Z April 2015 Challenge!!!! And I am an A to Z Participant. And it is Day 19, Letter S! 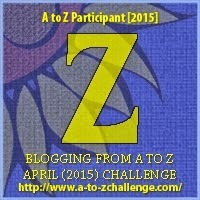 Click on the badge to go to more links for the AtoZ Challenge! First, let me say this - read this A to Z Challenge post. Then, let me say this - go visit me at Laura Shovan's at Author Amok today. I'm guest hosting for her clothing themed poetry extravaganza today! 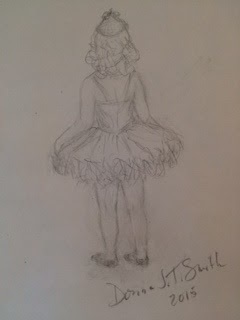 My topic is skirts, and I have some original poems, new and old, and some very old work by my favorite childhood poet. Thirdly, I want to say it is Earth Day! Celebrate! The first Earth Day was April 22, 1970. It is just Such a buSy day! I Simply could not Select juSt one poem today. I had to write two poemS here, becauSe I had two pictureS for S. I did the firSt one and then saw the Second Sign aS I was parked in town. 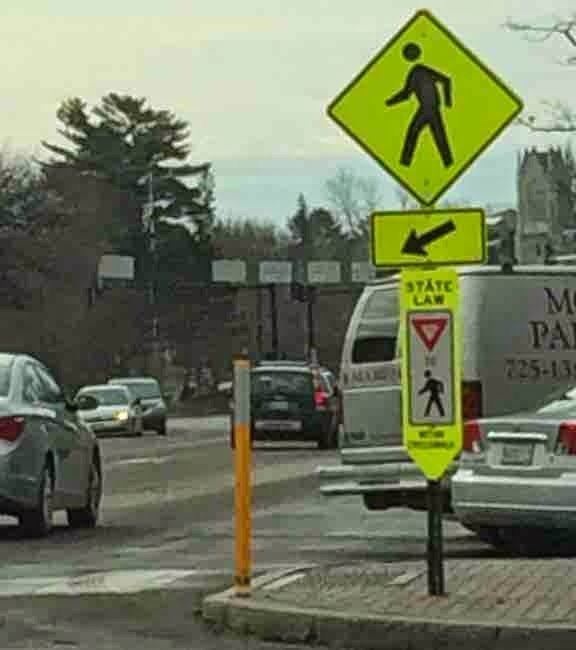 The Second one really Struck me funny when I read it aS a command, inStead of a picture telling you what the State law is about pedeStrians in a croSSwalk. To warn them this is so. All that you say you know? 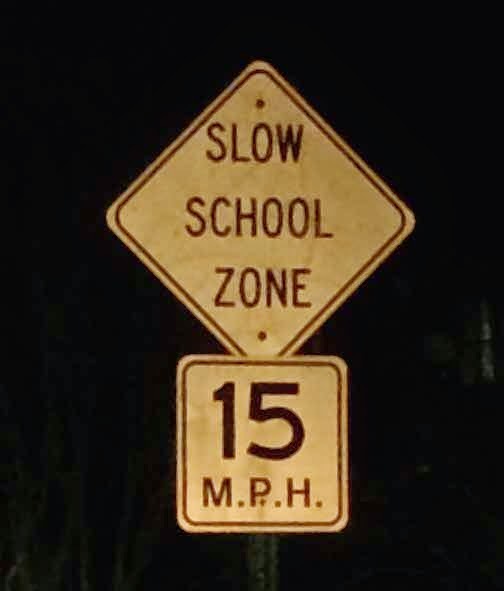 So slow down if you are staying! Here you go - found a better one! "State law - within crosswalk"
If it's for sea or land. That some people don't know. A cook should use a hairnet. As you step across quite near it. 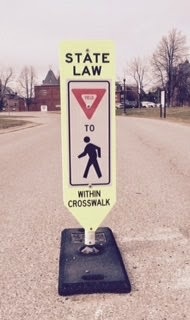 To "state law - within crosswalk"
Seems an awful law to me. 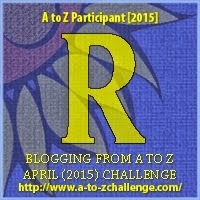 This is the Regal, Remarkable and Really Royal beyond belief A-to-Z April 2015 Challenge!!!! And I am an A to Z Participant. And it is Day 18, Letter R! For more AtoZ fun click on the R! Tomorrow, meet me at Laura Shovan's Author Amok for my guest post! The topic for April is Clothing Poems... I'll have a few originals and a few oldies and some good links, to boot - no I'm not doing boots. I cannot believe that we are on S tomorrow! Tomorrow is also Earth Day. And remember, I'll see you HERE again with some silly S stuff. My SOL, hosted at Two Writing Teachers, for Tuesday - I have begun reading with a child who is homeschooled, but whose mom is concerned about his progress. Ah, to be teaching and not testing. I am loving this time doing what I love to do, but not the ugly parts! I don't even have to do recess duty or bus duty! Finding printable books online, scouring the public library for appropriately leveled books, and dumping boxes of books from past teaching days or books soon to be a grandchild's... is there anything funner? Yes. Making up activities and games. Watching the osprey via web cam as they return to their nest. Finding out interests for later motivations and inspirations. 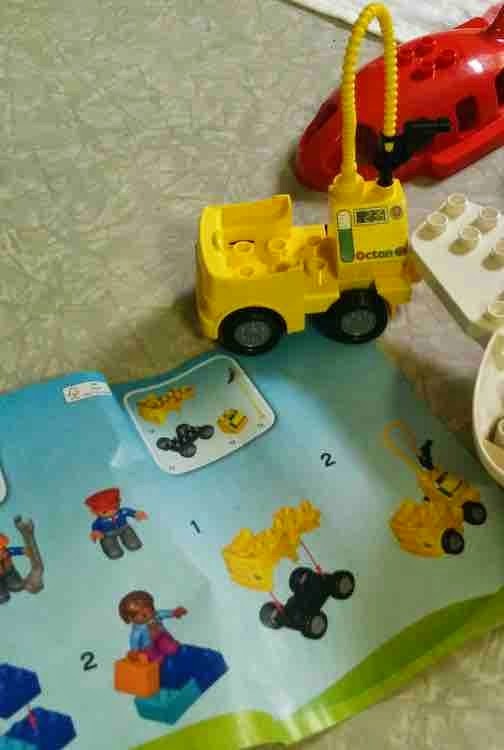 First he built for fun then he asked me for the instructions and made this truck! I know it's only 4 pieces...but he's only 3...and he "read" the directions. Give the kid a break! I am his grandmother, and I declare him a genius! 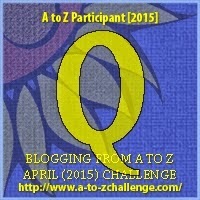 This is the Questionable, Quacky and Quirky Quintessential Gala beyond belief A-to-Z April 2015 Challenge!!!! And I am an A to Z Participant. And it is Day 17, Letter Q! On Wednesday, I will be guest at Laura Shovan's Author Amok, where she is posting clothing poetry for the month of April. 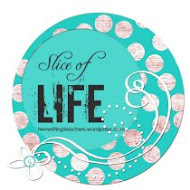 Click the Q to Quickly access mass Quantities of Quality AtoZ bloggers! No, just "quit the quitting"
Always read carefully. As Gilda Radner as Emily Litella would say, "Nevermind!" This is an "extra" poem, not a part of the AtoZ Challenge or any other poem group. The phrase "a color on the tongue" came to me while reading another blog way at the beginning of the month, or maybe last month. It wasn't exactly this phrasing, and I don't remember what the actual phrase was or the blogger who had it on their site, but something about it resonated with me and I jotted down the phrase. It has been fermenting (?) ever since, and I have jotted down parts of it ever since. It is quite unlike the way I work on poems, in that it did not just come in one sitting. I have returned to it a number of times and changed its wording and structure. Today I added the last stanza, and edited the first one (it used to be the last). And I changed a few words to now make it have a rhyme, which it didn't at first - at all. But when the first stanza (that used to be last) came to me, I wrote the real last one and returned to the poem to see what else could be changed. At another sitting, at some point, I realized though I'd said the word "color" there were really only vague references to color in a few spots, so that was changed. I'm not sure if it is done yet. But it is for today. My meaning for the poem was, that in my opinion, poetry should be attainable to all. If it is too obscure or personal, then it is not for public consumption. It's like a child who knows how to sound out words reading "Gone With the Wind". Yup. Got all the words right. Any idea what it was about? No? It's like me or almost anyone reading a textbook on nuclear physics. Did you enjoy it? Can you now apply it to your own life? No and no. I want to read, understand and enjoy poetry. Sad and depressing are not enjoyable to me. Sorry. I want uplifting. I want understandable. Some hard words are okay...I like learning new things. I don't even mind crying through a poem - just not as a steady diet. Nine happy to one sad is about my acceptable ratio. so poets' songs are sung. This is the Popular, Pampering and Positively Perfect beyond belief A-to-Z April 2015 Challenge!!!! And I am an A to Z Participant. And it is Day 16 , Letter P! Again this year I am writing a poem a day to celebrate National Poetry Month. It's my FOURTH YEAR in a ROW of writing a poem a day for the A to Z Challenge. My first year theme was Animals, the second was lobster boat names, and last year was Maine authors. 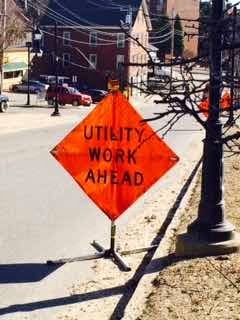 This year my poems will be paired with photos of signs I've taken the past few years. Signs have always fascinated me. Sometimes it's the mistakes on them, sometimes the different ways the language can be taken, and sometimes it's the surroundings that go with it. I have two pictures for today, but I decided on the second one for the poem. 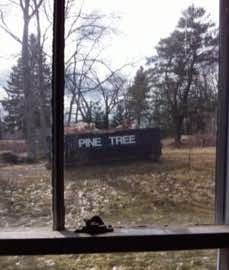 I did start one for the Pine Tree. I'm sure it would have come out clever, if I just could have gotten more clever with it. I twisted it around every which way, but it never produced a satisfactory poem. It is a lovely picture though of our dumpster we rented to clear out the old house in Friendship that we purchased 3 years ago. And this is the picture that did allow a poem to be written without too much ruckus. 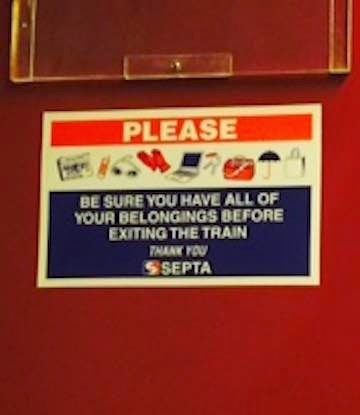 It was taken on the SEPTA commuter train on my way either to or from my daughter's home in Pennsylvania... which is another P word. I gave SEPTA a couple new acronyms. So that's what ACRO means... like acrostic... acronym... huh. Just noticed that. So how does acrobat fit in? I've got to go look that up now. ..We don't want your papers,.. ..Secure Each Parcel To Arms.. 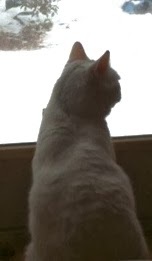 I hope you've been placated with P. It's been pleasant. Perchance we will see you for Q. Same place. Same time period. C is for Closing Doors!